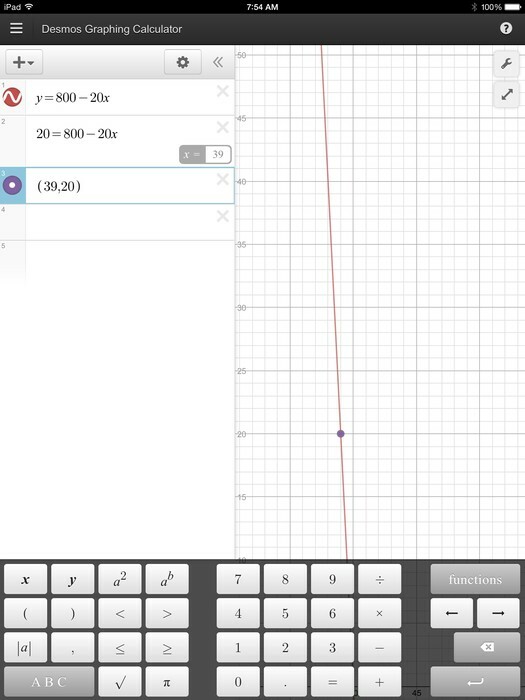 The function to determine the height for the first balloon is f(x)=-20x+800, in which x represents the number of minutes since the balloon was sighted. 800 in the function stands as the y intercept, which is, at what altitude was the balloon spotted. 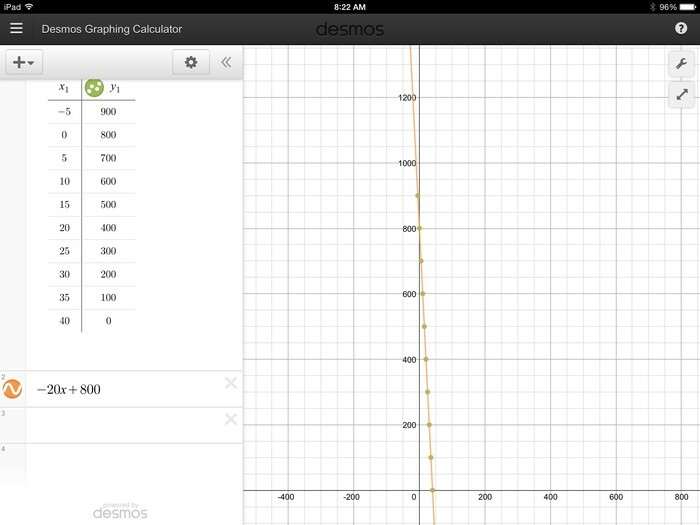 The -20x would stand for the slope, which the rate of how fast the balloon descends in altitude. Starting from 5 minutes before the balloon is sighted and ending when the balloon lands, the picture to the right shows the table and graph of the points (intervals of five min.). The balloon descends at a constant rate of 20 feet per minute. The y intercept is 800, which represents the point at which the balloon is sighted, and the x intercept is 40, which represents the point at which the balloon touches down. The height of the balloon 5 minutes before the first sighting was 900 ft as shown to the right. 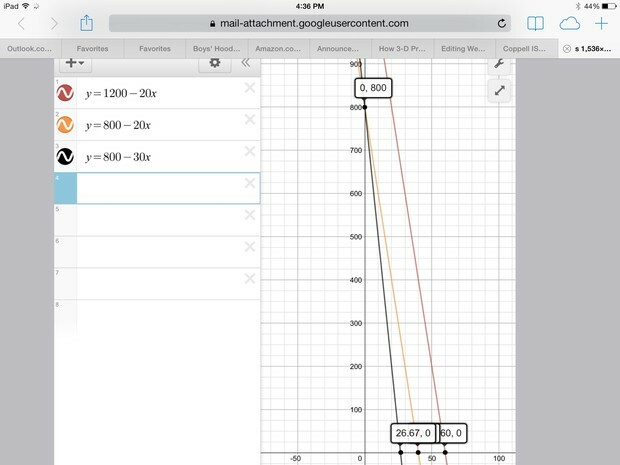 The point is 5 units to the left of the y axis because it's x value is -5, and the y value is 900 ft, so the point is also 900 units up from the x axis. 4. The Minutes to Get to x ft. When the balloon reaches 20 ft the time it took would be 39. 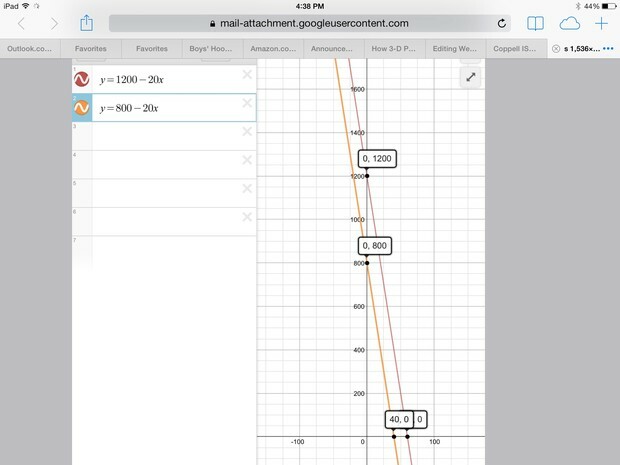 We figured this out because we plugged in 20 for the y-value because, we were measuring the altitude in feet, it came out to be where after 39 minutes(x value) after the sighting of the balloon, the altitude of the balloon was at 20 ft. 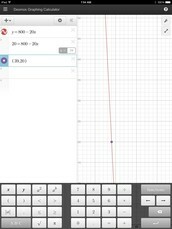 When the balloon lands, the time that it takes is 40 minutes, which we figured out because the calculation is equal to the x intercept. We already learned to plug in 0 for the y value, and that is exactly what we did. After a new balloon is sighted, the rate of its descending is figured out to be 20 ft per minute and the height at the first sighting is 1200 ft. The function would be f(x)= 1200-20x. It takes 20 more minutes to land, compared with the first balloon. This could be figured out by figuring out the x intercept of the function, which turns out to be 60. We already know that it takes 40 minutes for the first balloon to land, so 60-40= 20 minutes. The descent for the balloons is parallel because they both have the same slope. After a third balloon is sighted, it's determined that it's altitude is 800 ft and it descends 30 ft per minute. The function is f(x)= 800-30x. It takes 26 and 2/3 minutes for balloon to land after it was being sighted. Therefore, the third balloon lands 13 and 1/3 minutes before the 1st balloon lands. The reason this is, because we plugged in the y-value as 0 because we were trying to find the x-intercept. So the x intercept came out to be as 26 and 2/3 minutes. The 3 rd ballon goes down at a faster rate than the 1st balloon because of the slope. The 3 rd balloons slope is -30, the 1st balloons slope is -20. These balloons have been sighted at the same altitude 800 ft.
A fourth balloon takes off, starting from the ground and rising at a rate of 30 ft per minute. At exactly 16 minutes after both take off, they are at the same altitude of 480 ft. This is the intersection point. 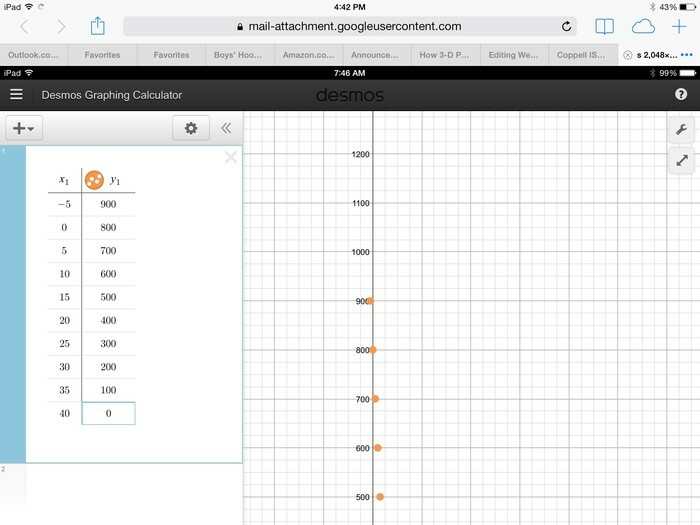 We could figure this out by making an equation to figure out the minutes it took, 30x=800-20x. The result of this is 16, and if we plug that value into one side of the equation, we come up with our answer of 480. If you cannot read the picture, what me and my partner are trying to do, is plug in the chosen X and Y values, to find the Y intercept. Since the X intercept describes when the balloon lands, the 1st balloon lands 40 minutes after it was sighted, so the coordinates of the X intercept for that line is (0,40). Since we want the 3rd balloon to land at the same time as the 1st balloon, we have to change the y intercept of the 3rd balloon's function to meet these terms. 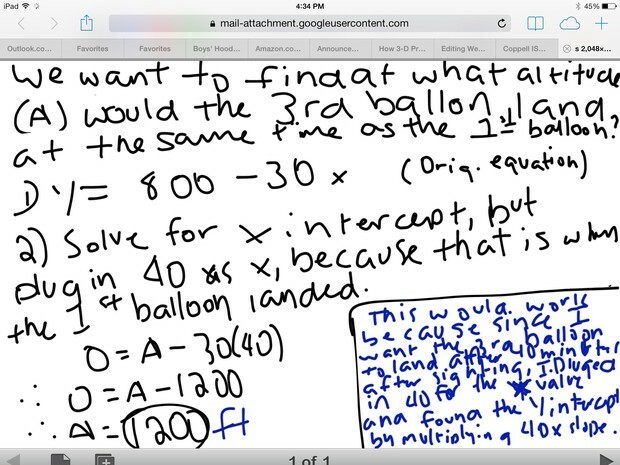 SO ending up, the equation for the 3rd balloon would be f(x)=-30x+A, where A represents the Y intercept. When we plug in for the Y value and 40 for the X value, the equation becomes 0=-30(40)+A. 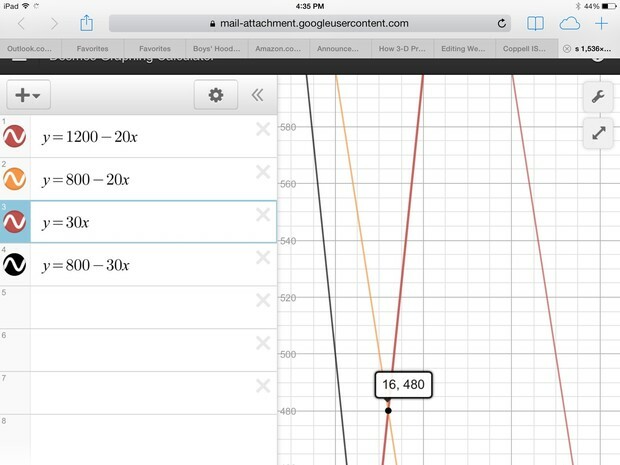 So when we solve the equation for A, A would be equal to 1200 ft.